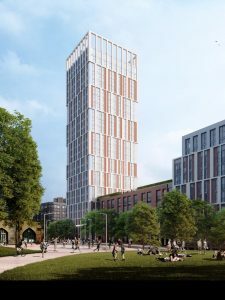 Bristol City Council is reviewing its approach to increasing the density of development in the city, which will replace its tall buildings policies. It has consulted on draft policies – see details of BCS comments. Following the Mayor’s lead, the policies encourage tall buildings. Bristol Civic Society does not support the Mayor’s statement, ‘I want Bristol’s skyline to grow. Tall buildings… built in the right way… in the right places…and for the right reasons…communicate ambition and energy.’ There was no public consultation to precede the Mayor’s initiative. Building high produces a generic landscape; Bristol will look more like Leeds. People are attracted to the city because it is historic, different, and largely low or medium-rise. Visitors contribute significantly to Bristol’s economy and employment. Other historic cities such as Vienna, Amsterdam and Copenhagen, have chosen to avoid high-rise to preserve their attractive life-styles. To harm the city’s historic character would be politically unpopular. Building high will not solve the housing crisis. Towers can cost 40% more than mid/low-rise buildings, are less floorspace-efficient because of lift shafts, extra concrete and other utilities. Social landlords are unwilling to manage high rise apartments because they are more expensive to heat and maintain. High rise flats are bought by those who can afford the additional cost and pay the higher maintenance charges. Towers will not solve Bristol’s core problem, housing those who need affordable housing. Tall buildings will not increase housing supply for lower-income groups. High rise does not mean higher density. Bristol’s sad post-war high-rise estates have low density. Clifton ward has Bristol’s highest density and is mid-rise. Encouraging high-rise will only profit developers who will receive wind-fall gains on their land bank. Don’t make or let people live in residential towers. Many have been antisocial, high-maintenance, ugly, and never truly safe. No fire engine can reach up 20 storeys. There is an opportunity for more holistic solutions. Bristol has space to accommodate the housing needed, while promoting happiness and well-being. The overwhelming evidence is that mid-rise housing in mixed-use streets are most people’s preferred urban form. Such densification will return us to something like the pattern of 19th century cities, the ‘tramway pattern’, a name that reflects how trams spurred the first great expansion of our cities while keeping people living near lively streets, in reach of public transport. The Society supports densification in Bristol if it is done well. Breaking the subject down into its various aspects, the Society’s views are as follows. – Building form – It is possible to achieve higher densities using different building forms and this does not have to mean high-rise development that an earlier planning regime encouraged. Tower blocks surrounded by sterile empty space can be lower density than the surrounding low-rise housing. Mid-rise buildings are the appropriate form of densification in most areas. Terraced housing along traditional street patterns is another efficient use of land and is the most sought-after housing. – Tall buildings – The Society is not against tall buildings in the right place. Tall buildings are appropriate in the city if clustered around transport nodes and close to employment centres. It is important to protect key views into out of and across the city. – Public realm – High-density developments must value the public realm. High density is not perceived if well-designed residential blocks are interspersed by attractive public streets and green ‘rooms’ to provide space and light and bordered by cafes, community and leisure facilities. It is the public realm, the space between the buildings, that gives a city its character. When the design of a city centre is its main attraction, density becomes less important. – Design criteria – Any proposal for development should be judged on a broad set of criteria, including: location; design; local and strategic context; transport and available or achievable social infrastructure. – Associated infrastructure – Intensified land use should support more shops, better local services and social infrastructure to support a more concentrated local population. Developers of larger sites should be required to prepare a report on the coordination of investment to unlock the value arising from more intensive land use. Levels of public transport accessibility. How a scheme would integrate with its surroundings architecturally. The availability and capacity of local infrastructure, schools and pre-school facilities, medical resources and retail provision.